As one of thirty-six small businesses accepted to participate in cohort 4 I'm excited to learn alongside fellow local business owners and scholars over the next few months. Detroit and Southeast Michigan is home to nearly 42,000 small businesses according to the U.S. Census Bureau and this is an opportunity for Commercial Progression to continue to grow and stand-out as a leader doing things better for our clients. The opportunity to utilize our new relationships with local businesses, educators, business advisers, and funding partners to deliver more services to more clients is thrilling. 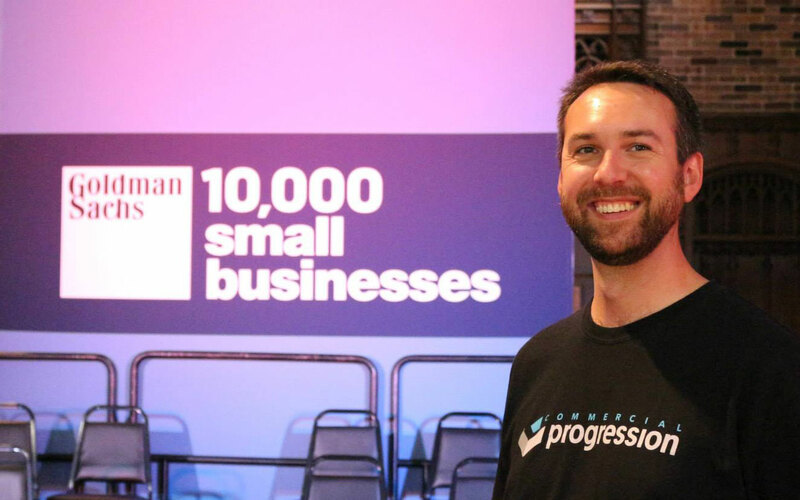 Alex Fisher graduated from the Goldman Sachs 10,000 Small Businesses strategic growth program on Thursday August 6th, ceremonies held at St. Andrew's Hall on the Wayne State campus. Photos from this well attended event are available on the Commercial Progression Facebook page complete with a speech from Michigan congresswoman Debbie Dingell and M. Roy Wilson, the president of Wayne State University. Under Alex Fisher's leadership, Commercial Progression prepares for an exciting new focus on strategic growth in team size, services, and clientele.